CAIRNS, Australia, Jul 24 2012 (IPS) - Most corals thrive only in shallow waters, where there is enough light for them to grow. But the rapid rise in sea level, due to the melting of polar ice, is making these conditions increasingly scarce. Measurements from tropical seas around the world reveal that the rise in sea level (3.3 mm/year) is happening at a faster rate than many corals have grown in the past 10,000 years, according to new research released at the 12th International Coral Reef Symposium (ICRS). Sea-level rise is just one threat to corals, which have been decimated by overfishing, pollution, and bleaching from warmer sea temperatures due to climate change, Jackson added. A colorful piece of coral is made up of thousands of tiny animals called polyps, which create cup-like limestone skeletons around themselves using calcium from seawater. Coral gets its beautiful colors from microalgae that live symbiotically with it. Q&A: "Cancun’s White Sands Wouldn’t Exist Without Coral"
Reefs form as generation after generation of coral polyps live, build and die, creating a habitat for themselves and about 30 percent of all the species living in the oceans. When corals are stressed by overly warm sea temperatures or pollution, they begin to look white or bleached due to the death of the algae. They become vulnerable to disease and die if the bleaching lasts long enough. Eventually, weakened or dead coral is broken into rubble by waves and storms. 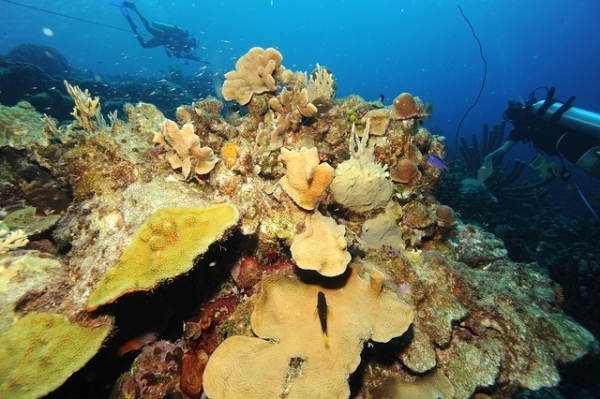 Jamaica may be the Caribbean country where reefs have deteriorated most. While it once possessed a great abundance of living coral, only five to ten percent remains, because of pollution and overfishing. “That’s happened because the people are so poor,” said Jackson. Each island is different, however. Bonaire and Curaçao have 20 to 30 percent coral cover left, and that may be growing due to good reef management, which has created no-fishing zones, reduced sources of pollution from the land, and controlled tourist access, he said. “Reefs provide coastal protection, food, tourism and other important services that have huge implications for human society if we lose them,” said Roberto Iglesias Prieto, a research scientist from the Institute of Marine Sciences and Limnology at the National Autonomous University of Mexico (UNAM). One study in Belize estimated that without reefs protecting the coastal communities, storms would cause 240 million dollars in damages. Overall, some one billion people depend directly or indirectly on reefs for their livelihoods, and more than two billion depend on seafood as a major source of protein. With only a few exceptions in remote locations, the quality of coral reefs has declined around the world and will continue to decline, said Iglesias Prieto. “It will be a tragedy for humanity to lose the benefits and services that reefs provide,” he told Tierramérica *. Marine scientists are united in saying that those vital services will almost certainly be lost unless urgent action is taken to reduce emissions of carbon dioxide that are both warming the oceans and making them more acidic. “When Captain Cook sailed by Cairns less than 300 years ago, the atmosphere contained 280 parts per million (ppm) of carbon dioxide. It is now 392 ppm, a 40 percent increase,” said Janice Lough, senior research scientist at the Australian Institute of Marine Science. In tropical oceans, most species live within a narrow range of water temperatures of about two or three degrees Celsius. If temperatures stay higher for long periods, then some cannot cope, nor can they always move somewhere else, Lough said. “Small changes can have big impacts,” she told Tierramérica. For many tropical reef fish, growth and reproduction decline when the water temperature goes up just two or three degrees, said Philip Munday, a researcher at the School of Marine and Tropical Biology at James Cook University in Australia. One apparently small but unexpected change is the fact that emissions of carbon dioxide are turning the oceans sour. The oceans have now absorbed about a third of all human emissions of this greenhouse gas. This has kept the global climate from warming faster, but the additional carbon dioxide is altering the oceans’ chemistry, making them 30 percent more acidic. Munday has also discovered that increased ocean acidity affects fish behavior in surprising and unexpected ways. “The ocean acidity we expect before the end of this century affects the central nervous system of some species, altering their sense of smell, hearing and reactions,” he said. The colorful clown fish (Amphiprion ocellaris), more popularly known as Nemo from the movie, will be fatally attracted to the smell of predators under these conditions, Munday has learned. These “sensory impairments” of reef fish and large predatory fish occur when the atmosphere contains 600 to 850 ppm of carbon dioxide, which is expected before the end of this century without efforts to reduce emissions, he said. The rates of changes in the oceans are far faster than species have ever had to adjust to, said more than 2,500 marine scientists in the Consensus Statement on Climate Change and Coral Reefs released at the symposium. But despite all the bad news about coral, there are “glimmers of hope” as shown in Bonaire, Curaçao and other places where there is good reef management and the impacts and stresses on these ecosystems are low, said oceanographer Jackson. “Fortunately, taking actions that are good for human society (like reducing emissions) are also good for reefs,” he added.